I don’t remember where I first heard about the dragon. 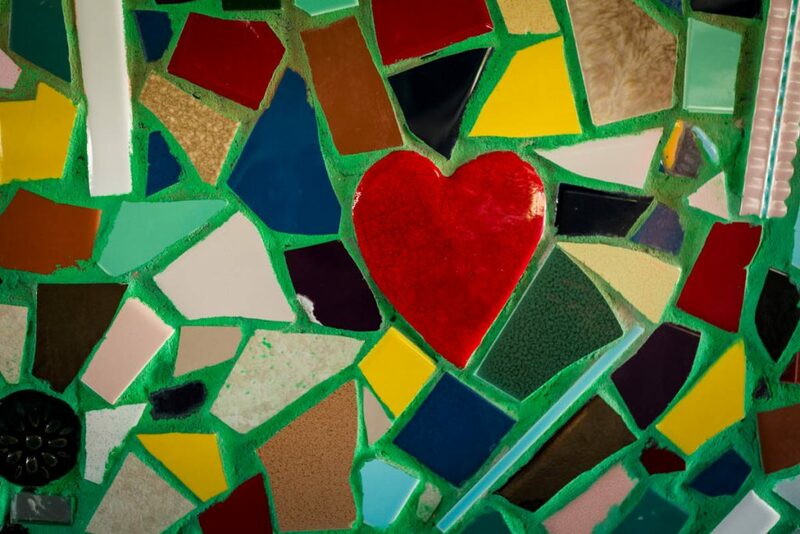 It may have been from reading a fading notice on the old Casino Star Theater. 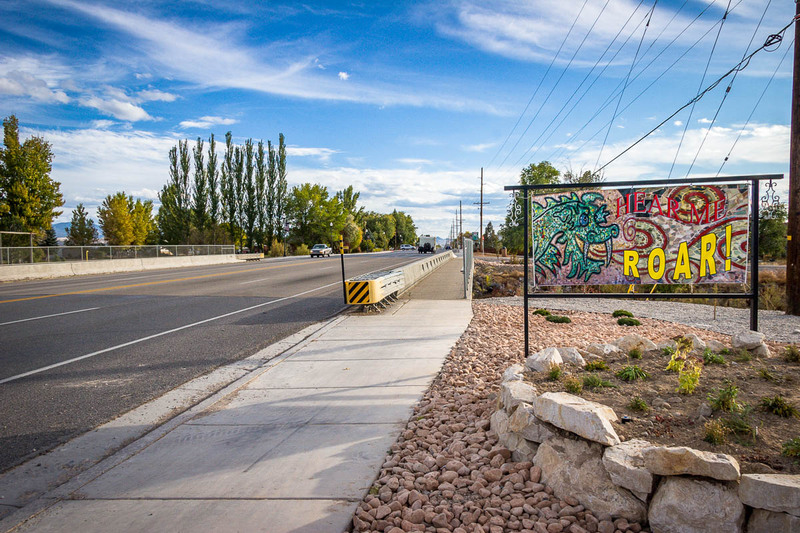 It read, “Under the bridge where highway 89 crosses the Sanpitch River, a benevolent dragon resides and gently roars.” I knew I had to see it so we drove up and down the road in Gunnison, Utah, searching for the bridge with the dragon under it. It turned out that the dragon was just south of town but not very obvious from above. The first time we visited there was no sign to indicate the location but that has since been rectified. 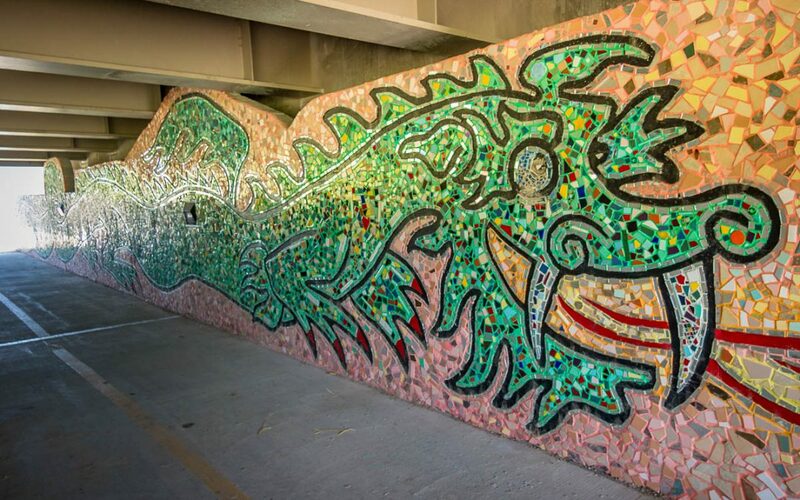 What you will encounter when you walk under the bridge is a 218 foot long tile mural featuring a friendly-looking green dragon spouting red flames. 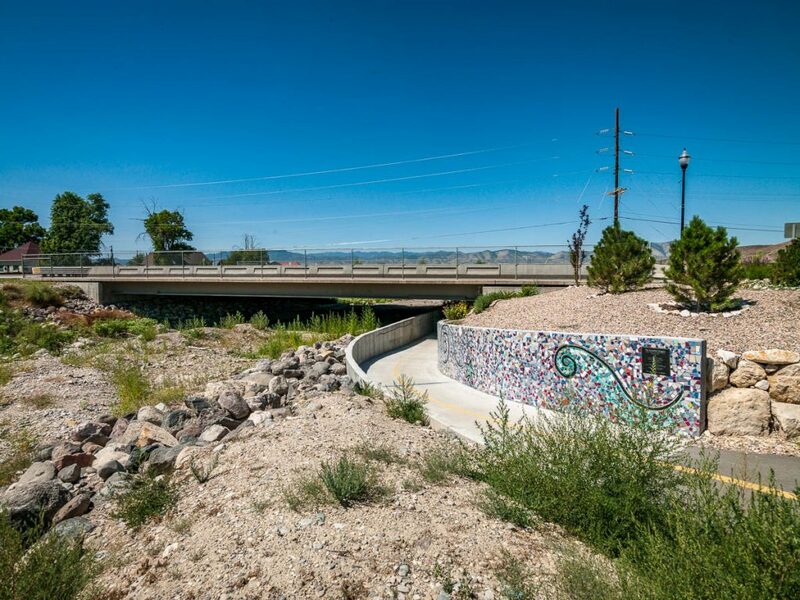 The mural is along a developed path on the Sanpitch River. As the story goes, when the River Walk was being dedicated a truck drove over the bridge and a young girl said it sounded like a dragon roaring. 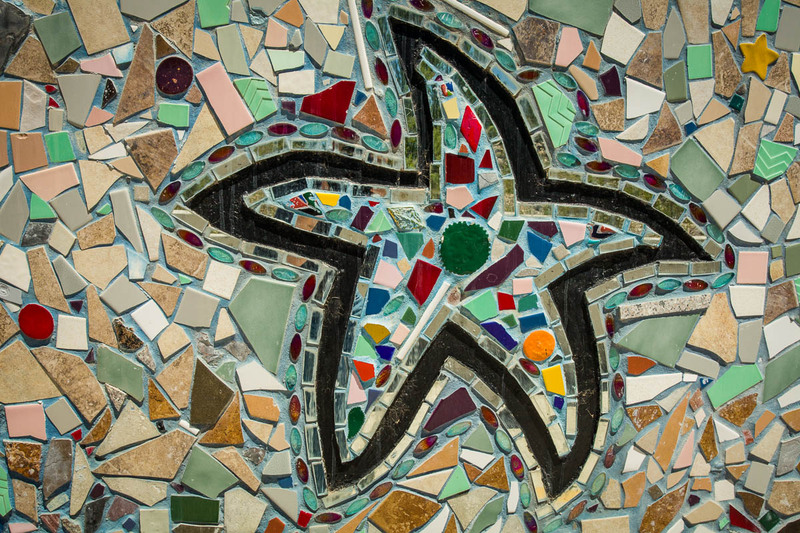 The idea took hold and a community project developed to construct the dragon. The projects sponsor, the Casino Star Theater Foundation, received grants from the Utah Arts Council and others. Students at local schools made drawings of how they thought the dragon should look. 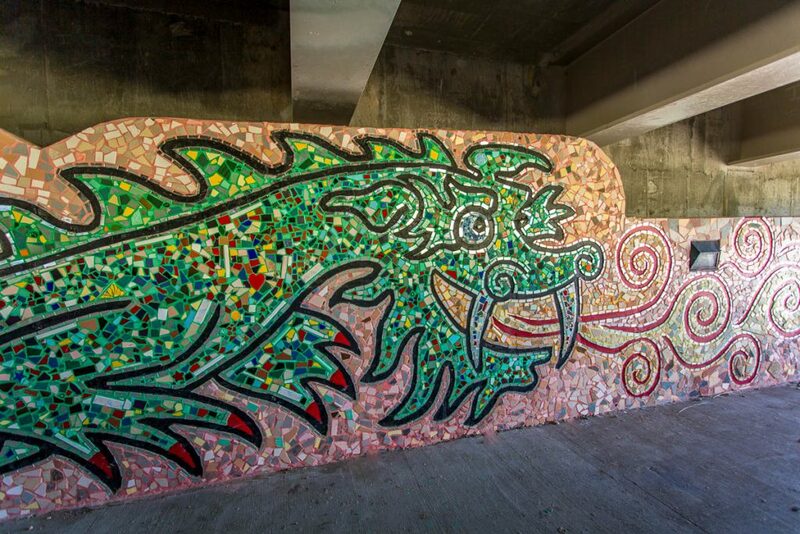 Artists Elise Lazar and Kinde Nebeker used the drawing as a basis for the design.They outlined the dragon on the wall of the underpass and in May, 2007, hundreds of school children set to work creating the Sanpitch Dragon. 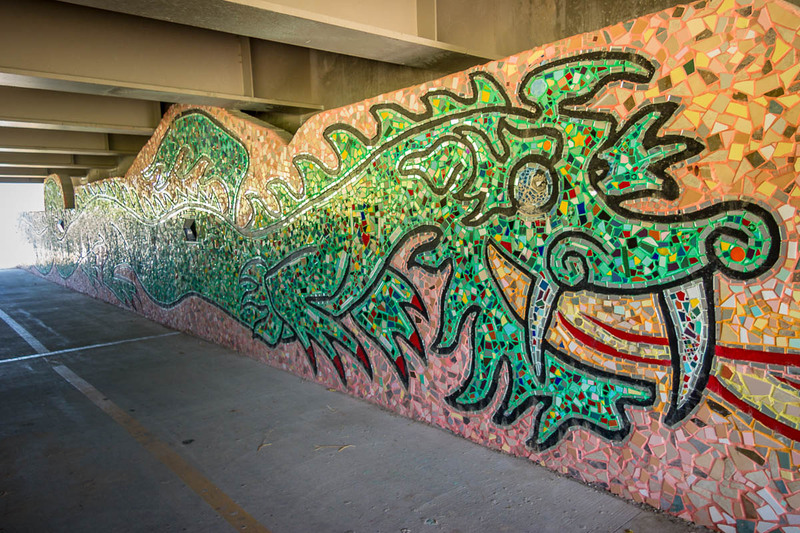 Now this benevolent dragon lives contently under highway 89 along the Sanpitch River and comes to life with a roar every time a car passes overhead. To find your way to Gunnison and the Sanpitch Dragon, go to the Sevier to Spanish Fork Road Trip Guide.